Neuse Charter's Colin Danielson (11) awaits a pickoff attempt while Princeton's Dayde Farrell (15) slides back in during the April 10 1-A Carolina Conference game at Neuse Charter. Danielson drove in the winning run in the 10th inning. Princeton's Kameron Ballance, left, awaits a pickoff throw as Neuse Charter's Kreston Parker stands on second base during the 1-A Carolina Conference rivalry game. 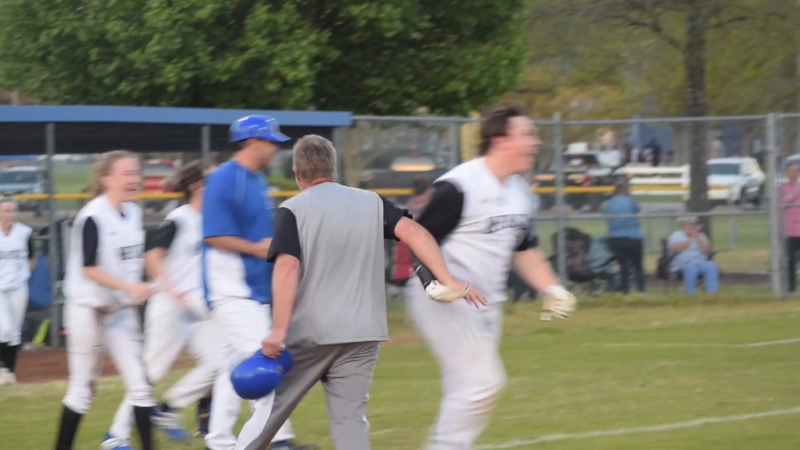 Parker would score the winning run for Neuse Charter. SMITHFIELD — Neuse Charter School took down 1-A Carolina Conference rival Princeton, 4-3, at home April 10 in a 10-inning thriller via a walkoff error. Freshman Collin Danielson came up to the plate with the bases loaded after senior Kreston Parker’s single deep into the outfield. Danielson chopped a pitch to the shortstop who tossed the ball over the second baseman’s head to allow senior Kreston Parker to score. “We could get a sac fly or a hit so really I was just thinking win the game really,” Danielson said. The win gave the Cougars (4-11, 2-6 CC) the first sweep of a conference opponent in the baseball program’s history. All the players were excited about making history as they dumped a cooler of water on their head coach Jeremy Repka. The team is hoping that this win could be the start of a late season run. The loss was the Bulldogs’ (4-8, 2-6 CC) fifth straight. Between the two teams only one earned run was scored. Princeton senior Will Gurganious pitched 3 1/3 innings allowing four hits, the unearned game-winning run and a walk while striking out two. Neuse Charter freshman Aidan Phillips pitched the final five innings to pick up the win, allowing no runs and three hits while punching out two. WP-Aidan Phillips (1-0) 5 IP, 3 H, 0 R, 0 ER, 0 BB, 2 K. LP-Will Gurganious (0-1) 3 1/3 IP, 4 H, 1 R, 0 ER, 1 BB, 2 SO. LEADING HITTERS — Princeton: Will Gurganious 1-3, RBI; Charlie Benton 2-4, RBI. Neuse Charter: Colin Danielson 2-5, 2 RBI; Elijah Batts 1-4, RBI.